This is the perfect soup for a cold day or for when you want something to eat and can’t decide what you want. It is rich and filling even without the usual ingredients of milk, cheese or cream. I especially like this on days when a big dinner is coming, but I need to eat something beforehand. 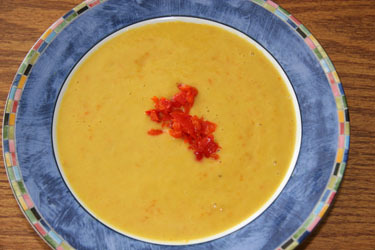 The more you make this soup, the more you will find that you can vary the ingredients and their quantities. Put ingredients into skillet or sauce pan and cook until squash is tender. 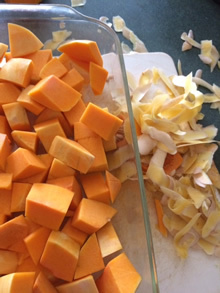 Place all hot ingredients into food processor or blender, mix with water or broth and blend it to the desired consistency. In the meantime, put the sliced red pepper into the pan to sautee and cook until tender. Pour blender contents into a bowl, then top with the pepper and it's ready to eat.